Life, Lavoro and Luca: Man's best amico? Well, finally it’s here – that blessed month when the motorway is free from tailbacks, the boss is on the beach with his phone switched off, and you can find a parking space almost anywhere without getting into a fight in the middle of the street with a stranger…. Lovely, lovely August!!! It’s a shame I’m still stuck in the office with reporting and a presentation to finish before the big finale tomorrow, but then it’s no more work until SEPTEMBER! Woooooooo!! Ok, pulling myself together now…. On a much heavier note, there are still problems in our neighbourhood, and not just between us and the ignoramus couple downstairs, but it would appear, between just about everyone. Sunday morning at 8:30 we were woken up by constant, incessant barking from the neighbours’ dogs, who spend their days side by side in adjacent gardens, with just a wire fence to separate them and so, every now and then they decide to drive each other – and the entire neighbourhood – insane by barking, growling and generally throwing themselves at the fence. On Sunday morning, the larger, more aggressive of the two managed to jump the fence and as we raced onto the back balcony to see what was going on (the sound of animals fighting and injuring each other is unmistakable), we were greeted with the sight of the attacking dog’s owner attempting – and initially failing – to split them up. After what seemed like minutes, but was probably only seconds, the neighbor managed to drag his dog away, leaving the poor little other one bleeding, limping and terrified. We were immediately all on the scene (although the injured dog’s owner was not home) and, following a frantic call to the emergency vet, the dog was bundled into the neighbour’s car (still bleeding and shaking, poverino….) and taken to the veterinary pronto soccorso in Pavia. We later heard that he had a broken leg and some scratches, but other than that he was OK, and is now recuperating in his owner’s garage. This is the thing. Here in Italy the general opinion (and I heard this more than once that same morning) is that you can have a dog as long as you have a garden, regardless of how much time or energy you dedicate to it. They just don’t get it! Aside from the attack (which could have happened anyway), it breaks my heart that this little dog spends all day everyday by himself in the garden, is fed in the evening and put straight into the garage until the next morning. His owner is a lorry driver and so spends long periods of time away, during which time another neighbor carries out the daily garden-garage-garden ritual, but it’s not enough for an animal which has 1. The need for human / canine company, followed by 2. The need for space and exercise. Even when his owner is home, he never takes the dog anywhere and won’t keep him in the house. I just don’t understand this collective ignorance with regards to pet ownership. Where I come from everyone knows that leaving a dog for hours on end by itself is a form of cruelty; here even the most “enlightened” members of the community seem to stick to the old adage “as long as you have a garden to leave it in…..”. This issue really distresses me. Italians think that the English are “too soft” on their animals and treat them too much like human beings. So what?? Isn’t it better to do more than is necessary to improve the quality of life of a living creature than to do less than is necessary just to ensure that that creature has a basic quality of life? And don’t get me started on the abandonment issues here. Yes, I’m very excited to be leaving for my summer holiday in Sardinia next week, but I am also very aware that this area of Italy has a huge problem with abandoned pets, as – believe it or not – people actually take their animals with them from the mainland and purposefully leave them behind, knowing that they will be unable to find their way home! One hundred thousand dogs are abandoned in Italy every year, the majority during the hot summer months, when their owners have the chance to dump them far from home (or even on the motorway), in order not to have to take care of them for the rest of the year. I love August, I do, but I wish it could be a happy, carefree month for everyone – also for pets. If only the rest of the country – my neighbours included – saw it this way…. So sad for the little dog.. :-( I think he needs to be in a new home, with a loving owner. I don't understand that mentality either. It doesn't even make sense. What's the point of owning a dog if they don't want to interact with it? Hi! My name is Jessica and I am a writer living in Virginia, US. 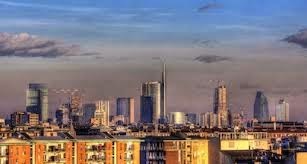 I am trying to make some contacts with people who have lived or are living in Milan, Italy for a novel I am working on. I want all the juicy details of what life is like in Milan (the good, the bad and the ugly). I would love if you would help me out and email me! jwilliams1284@gmail.com Thank you!! !